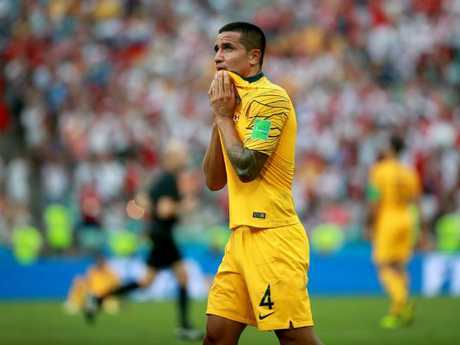 TIM Cahill has boxed his last corner flag for the Socceroos, having called time on his international career to leave the biggest hole in Australian football history. His 107 games is second only to champion goalkeeper Mark Schwarzer - who had 109 caps in a two-decade Socceroos career - and no one comes close to the 50 goals Cahill netted. He's the only Australian to have featured in four World Cups, and owns the rare distinction of having scored in three. He leaves an extraordinary legacy and is inarguably a Socceroos great: in fact the only thing up for debate is whether or not he stands alone as the greatest ever. Strong cases can be made for Schwarzer, legendary striker Mark Viduka and the gifted Harry Kewell. So, too, the mercurial Mark Bosnich, Joe Marston - the first Australian to compete in an FA Cup final - and Mark Bresciano. Viduka dominated leagues in Australia, Croatia and Scotland before making his mark on the English Premier League, finishing with 92 goals for Leeds, Middlesbrough and Newcastle United. 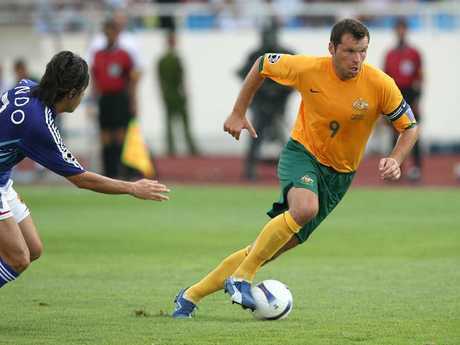 Few Australians have enjoyed as much domestic success as Socceroos great Mark Viduka. Kewell was as talented as any Australia's produced, and enjoyed Champions League success with Liverpool after breaking through as a precocious teenager with Leeds. All had exceptional records at domestic and international level. But surely none can match Cahill for achievements in the green and gold jersey. For the past 15 years, Cahill has been the man for every crisis - with his fingerprints all over every moment of success experienced in that time. To have reached his fourth World Cup at the ripe old age of 38 was a special achievement in itself, even if he was unable to match the incredible feats of Pele and Cristiano Ronaldo by netting in four consecutive Cups. Captain Mark Viduka (7), Tim Cahill (4) and Harry Kewell (back left) celebrate Australia’s qualifying win over Uruguay. With Australia's World Cup hopes well and truly on the ropes, Cahill produced one of the finest performances of his career - playing an extraordinary 120 minutes, and banging in both of Australia's goals, including the extra-time winner. It came in typical Cahill fashion - rising above the pack to nod it home, right when Australia needed it to set up a final qualifying playoff with Honduras. "He's just a freak," said coach Ange Postecoglou after another Cahill-inspired great escape. "I can't think of when he last played 90 minutes, let alone 120. He's got real belief in himself. He's just a unique, extraordinary individual." No, this isn't his memorable brace from the 2006 World Cup - that will come later - but rather his vital performance at the MCG in 2009 which helped pilot Australia to the 2010 edition. With Australia trailing 1-0, Cahill banged in a double - a back-post header followed by a tap-in off a corner - to break Japan's hearts. The winner, coming 13 minutes from time, netted a crucial three points in their qualifying campaign. The 2015 Asian Cup was a rare triumph on the world stage for the Socceroos, and as ever they had Cahill to thank for much of the success. The brilliant midfielder scored a second-half brace to crack open a tense quarter-final against China which loomed as a major hurdle. After a cagey first half Cahill broke the deadlock three minutes after the break with an absolute gem: a stunning, acrobatic bicycle kick which China's keeper Wang Dalei never got near. The most technically impressive of Cahill's 50 Socceroos goals, this stunning volley came moments after the Netherlands had opened the scoring through Arjen Robben. Needing a boost, the Socceroos turned to Cahill - with Dylan McGowen floating a long cross into the box that gave the superstar a sniff. It was all he needed. Cahill watched the ball sail over his shoulder before unleashing a spectacular left-footed volley that cannoned off the underside of the bar and into the goal. To this day Australia's finest World Cup moment - and only victory - was inspired by some Cahill brilliance. Trailing 1-0 with six minutes of regulation time remaining and Australia staring down the barrel of a defeat in its opening game, Cahill unleashed a devastating double. Cahill changed the match in a remarkable five-minute spell - knocking home the equaliser after a wild scramble in the box before a powerful strike into the top left corner from outside the box put the Aussies in front in the 89th minute. Australia earned their first World Cup win, and it set up their only ever appearance in the knockout stages.